Creating a fun and vibrant place to store your most valued possessions is an excellent idea, especially if you have an unused room right next to your bedroom. This means that the work is halfway done for you and no exterior extension needs to be built for your dream closet to become a reality. Adding in this decorative and uncluttered storage area to your home is the ultimate way to get your bedroom looking tidy and at the same time allowing you to hone your organisational skills for an even more amazing planned and well-laid out home space. This will ensure maximum use of all corners of the closet without anything looking out of place. 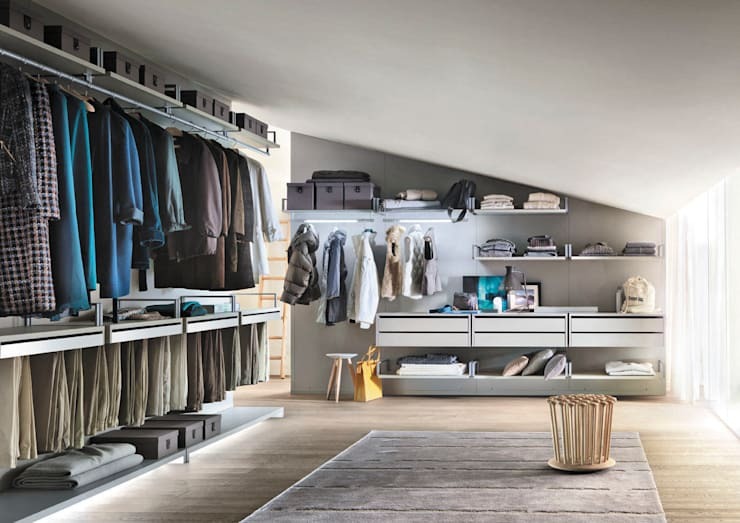 Clever storage spaces, excellent lighting, well-placed mirrors and some fun decorative elements will complete the walk-in closet with personalised touches. When deciding on this excellent use of space within the home, it is probably best to contact an interior designer first, especially if you are not sure where to begin with the project and how to plan the décor and furniture, taking into consideration the functional space available and the best means of planning layout of the room. Consulting an interior designer means you will always stay ahead of the curve in trends and colours for the room as well as the materials to use, a designer may often assess the individual taste of the home owner and have a look at possibilities to best suit their home style and characteristics. The interior designer will take into consideration the individual ideas and ensure that each section is taken care of, with adequate storage for clothing, shoes, accessories and even handbags if needed, with enough lighting included in the space to make it look as brilliant as desired. By consulting an interior designer, you may cut down the workload of finding a hard-working and reliable joiner, which in itself is often a headache, especially if you don't consider yourself too hands on and would prefer hiring help to do the heavy lifting for you. A joiner will take care of the actual manual labour of fitting and cutting your cabinets and dressing table to create the shell for your stunning walk-in closet. The measurement and procurement of enough materials that will your space come alive, fits into the actual building of the dressing room space. The joiner will ensure that the finishing touches of your walk-in closet is completed in the manner that you would like, with enough shelves, cabinets and tables to ensure that your most prized possessions each has its perfect place to live. The layout of the room is obviously the most important means of ensuring that cabinet storage space will be maximised. 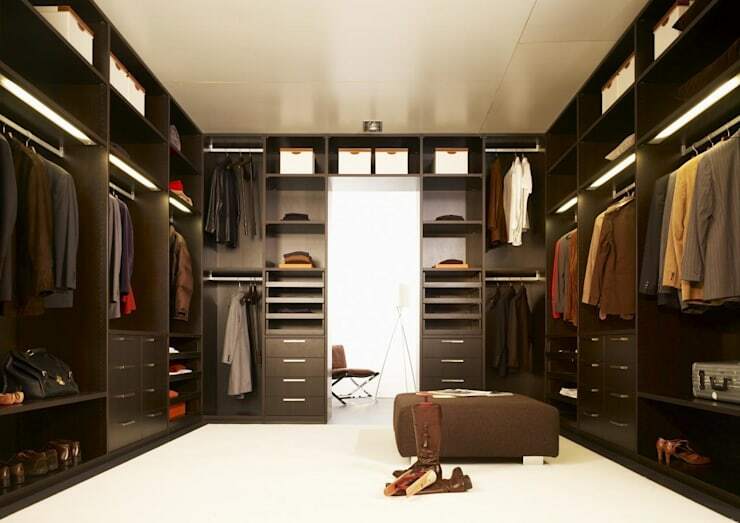 If you are however planning on making your walk-in closet an interior extension of the bedroom, it is integral to consult an architect to ensure that the wall is not load bearing before taking a hammer to it and causing more harm than good to your home. This image is an excellent example of excellent planning and layout, with more than enough space allocated for clothing, shoes and handbags and complete maximised use of the walk-in space. With enough comfortable additions to add in a sofa for relaxation too. The image highlights the spectacular appeal of the of how best to make use of a limited space to create a functional walk-in closet area, the lighter and more neutral tones will ensure that the room remains trendy and stylish for a long period of time, while the lighter hue also gives the illusion of a larger room. Have a look at more interior design ideas from Bravo London LTD. This is an excellent example of how natural sunlight can be used to make a room more comfortable and inviting during the day. 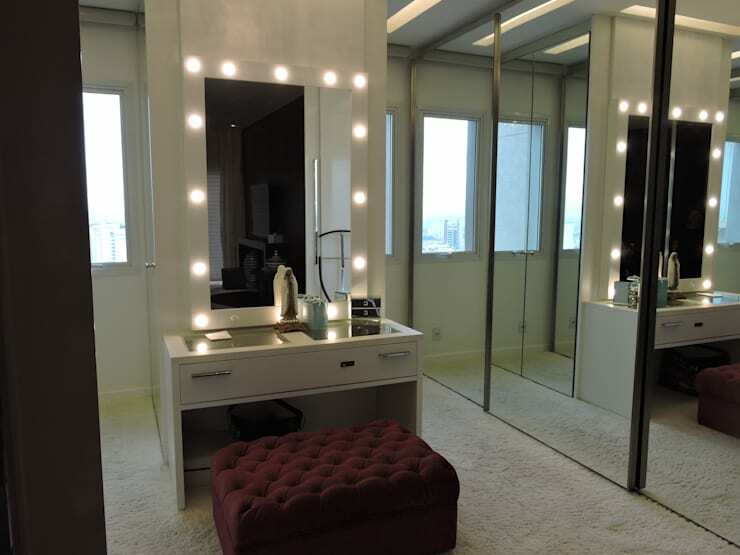 The inclusion of a dressing table in front of a bright window adds an enchanting effect to the walk-in closet, especially since the shape of the mirror is rather different. The mirror effect creates a sense of charm and elegance to the home space, but maintains and vibrant appeal. The all-white shelves and storage spaces further accentuates the illusion of a bigger walk-in closet, but excellent planning of the style and shelves allows for the entire space to be perfectly placed. The soft, comfortable rug adds a sense of luxury and fascination, while the two colourful chairs are almost magical and vibrantly whimsical in their appearance, making for an excellent addition to an otherwise neutral toned walk-in closet. 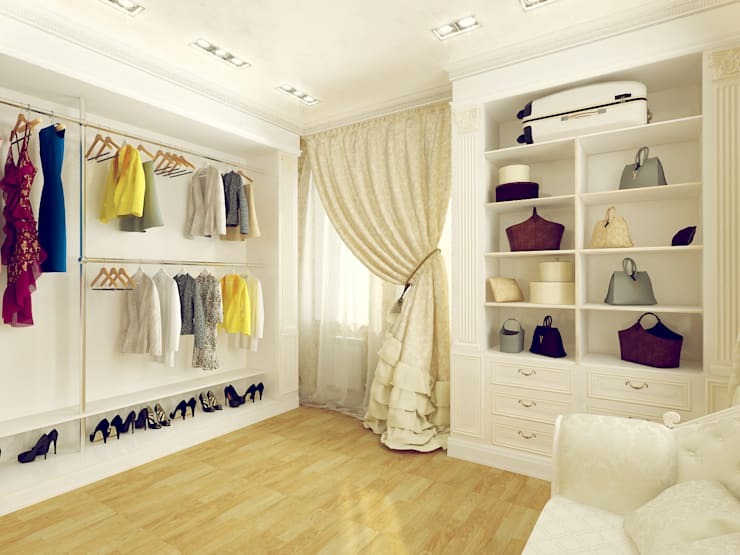 If you need any more inspirational ideas, check out: Wardrobe Interiors. 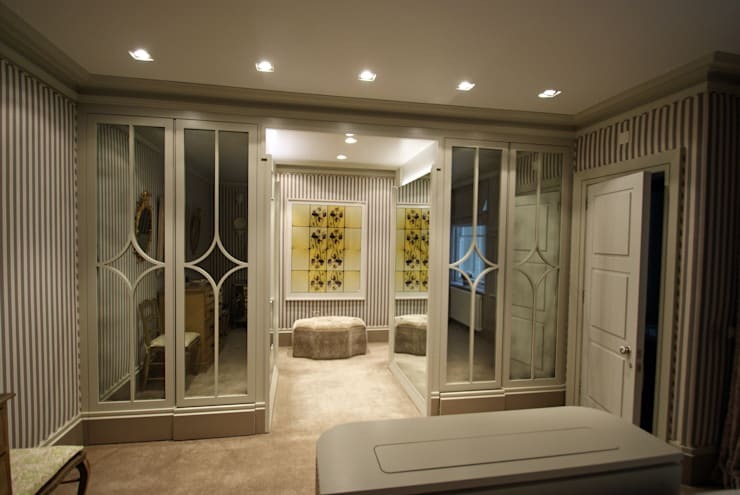 The mirrored effect created in this luxury dressing room adds an excellent sense of style, class and quality to this walk-in wardrobe space, almost providing that extra Hollywood touch and appeal that makes a home just so much more complete. This vintage inspired dressing room with illuminated mirror creates an even more vibrant and brilliantly enlightened closet area. Adding mirrors creates a brighter illumination within the walk-in closet and maintains a minimalist effect if the mirrors are actually cupboard doors. This example is everything which mirrors and lights could possibly be in a closet space, making the world of difference to the lighting, creating a spectacularly dramatic yet pleasantly beautiful closet that meets all the needs of the imagination and the decorative perspective elegantly. The wine coloured furniture and neutral tone of the flooring adds to the overall tasteful look to the room without it being too ostentatious, with the mirrors creating the most effect and attraction. Although the tone of this exceptionally designed and decorated walk-in wardrobe is understated and neutral, it has a touch of a dramatic appeal too. The vertical stripes of the wallpaper creates a subtle effect, while the beige and cream tones of the furniture, cabinets, doors, ceiling and soft luxurious carpets adds a stylish and almost vintage feel. Decoration here is more than just the colours and wallpaper that have been included in the design aspects, the wall inside the dressing room has a vibrant edge to it with the yellow touch of the art piece. The modern lights located throughout of the cabinet adds a touch of class and creates a brightened effect through the use of perfectly placed mirrors. While the mirrored cabinets have a design on them too, creating an even more vintage feel. A bedroom without a fashion forward storage area such as a walk-in wardrobe doesn’t have that modern, minimalist appeal that homes modern contemporary homes require. Do you have a spare room? Are you feeling tempted to gain some extra closet space? Let us know!